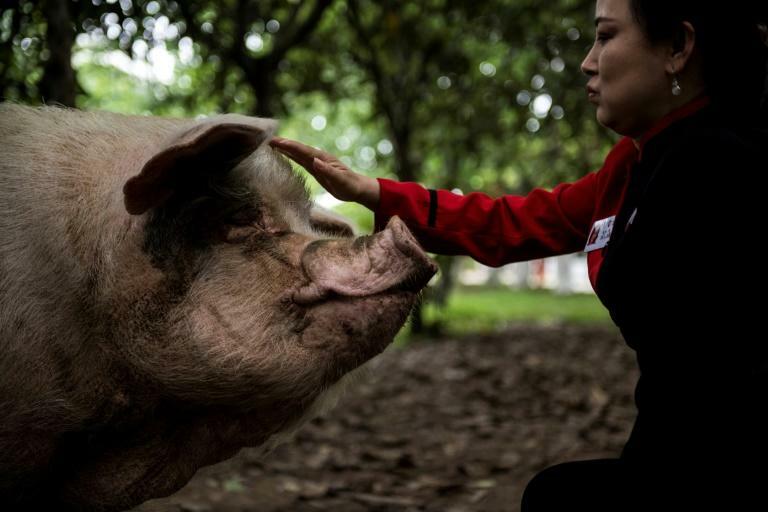 This was supposed to be a feel-good story about a pig that became a national icon after surviving a devastating earthquake 10 years ago in China's southwestern province of Sichuan. 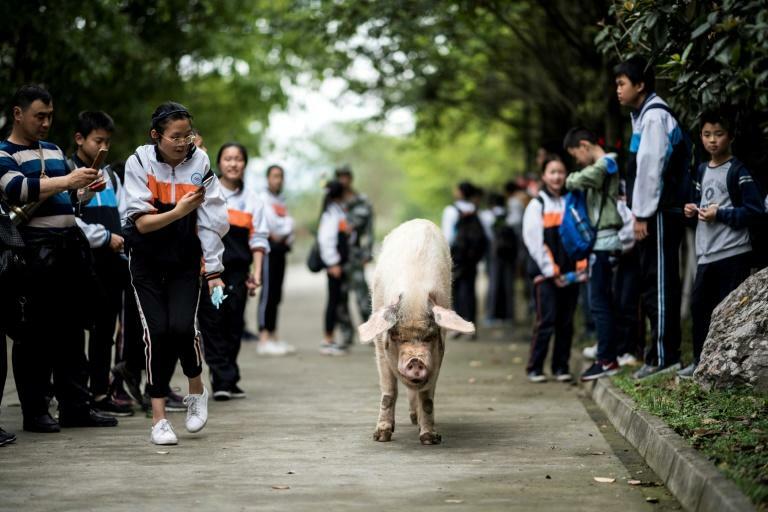 But the local public security bureau had a different idea: three plainclothes officers stopped AFP journalists from completing their reporting and escorted them out of the museum where the sow is living out her days. The heavy police presence shows how sensitive the earthquake remains 10 years after the massive temblor left 87,000 dead or missing, including thousands of children killed in the collapse of what many believe were shoddily built schools. In the years after, the government -- which has never released an official investigation into the accusations -- silenced those who tried to shed light on the catastrophe, including renowned artist Ai Weiwei, who was detained for months and beaten by police. The pig, known as "Zhu Jianqiang" which means "Strong Pig", shot to fame after being discovered alive beneath rubble, 36 days after the 7.9-magnitude earthquake struck Sichuan province on May 12, 2008. The response became a source of national pride as the country's military and charitable organisations rushed to help survivors, and Zhu Jianqiang became a symbol of resilience. She survived on rainwater and a bag of charcoal during the ordeal and was sold to the Jianchuan Museum -- a cluster of exhibition halls devoted to recent Chinese history -- which agreed to nurture her for the rest of her life as a reminder of the nation overcoming adversity. While some aspects of the earthquake remain highly sensitive, authorities warmly welcomed reporters interested in writing uplifting stories about the success of reconstruction or survivors’ resilience. But in China, it is always hard to know where the line is. And in a country where it is illegal to disparage national heroes, even a famous pig can become a sensitive subject. As the tenth anniversary of the earthquake approached, foreign reporters seeking to report on Zhu had to file a formal request with the provincial government. On a recent visit, a team of media officials met a group of foreign and domestic journalists at the museum's visitor centre and then accompanied them on a small tram to see Zhu, whose massive bulk was draped across a pile of hay inside a glass enclosure. Her front legs were injured during the earthquake, and she has difficulty standing. The problem was nearly fatal, according to a recent Chinese media report, which said Zhu was on her last legs after becoming too fat to stand. But a diet -- and an indomitable will to live -- got her back on her feet. At the ripe old age of 11 -- over 80 in human years -- she spends more than 20 hours a day sleeping, rising in the afternoon for the first of two daily feedings. As her keeper, Gong Guocheng, entered the pen with a bucket of slop, the determination that earned Zhu her name was on full display: as she struggled to stand, she unleashed a series of agonised shrieks, terrifying a group of schoolchildren. But soon enough she was ambling amiably through a nearby orchard, snuffling through the fallen fruit and letting visitors pet her. "It's Zhu Jianqiang!" 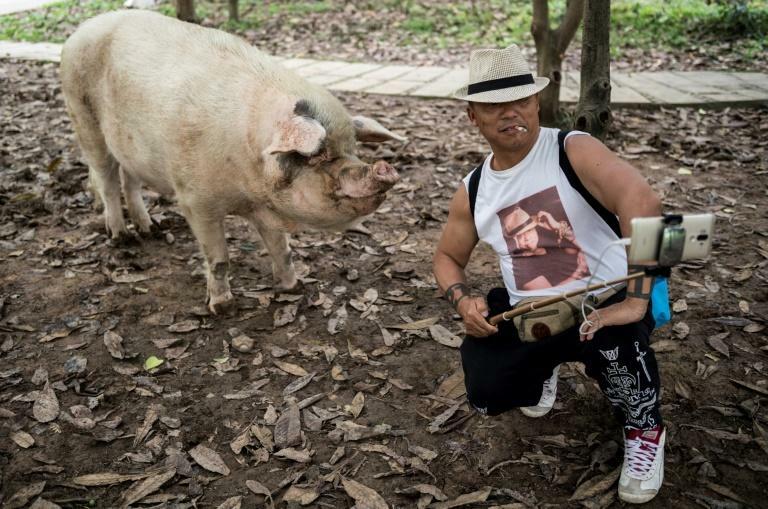 an elderly tourist shouted as the hog lumbered across the pavement back to her pen. "It can't be her, I heard she's dead," his wife said dismissively. As an AFP reporter tried to chat with visitors, three plainclothes police stopped the interview and began questioning the journalists about their plans for covering the earthquake anniversary, before escorting them out of the museum. The officers, who repeatedly refused to give their names, then followed AFP reporters to the town's border in an unmarked car. As the police tussled with journalists, a man visiting the museum with his parents, watched Zhu tottering among the students: "She's a symbol of China's strength."